Why should you buy at World Toyota? Not only because we give you a world class experience, but also because we take care of you. We have but one goal: that you are 100% satisfied with your purchase, the terms, the service and the experience. We are so sure you will have the best possible experience that, we guarantee it! Now that you have read all the ways that World Toyota takes care of you, stop by and let us show you how easy it is to provide you all of your vehicle needs. 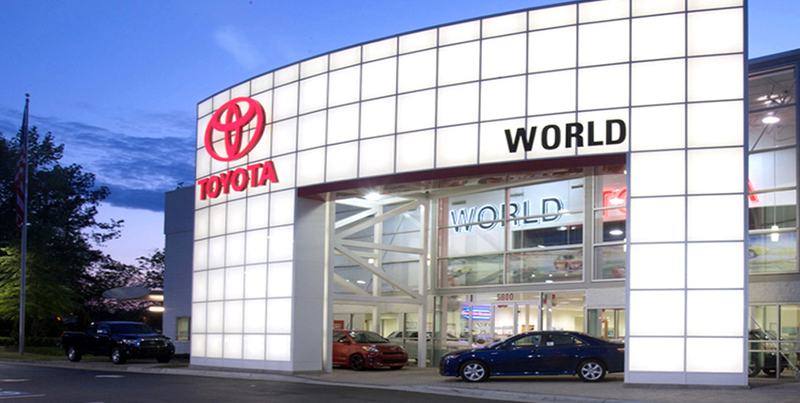 World Toyota is here to meet all the automotive needs of drivers in the Atlanta area. Whether you’re looking for a new car, used cars in Atlanta, a Certified Pre-Owned car or parts and service from our leading Toyota service department, we’re here for you. We have a large inventory of carefully selected vehicles, and our friendly, knowledgeable staff strives to ensure a premium experience, from finding your dream car to getting the best financing deal to maintaining your vehicle. At World Toyota, we know that buying a car is a major decision for every guest who walks through our doors. Our goal is to make every step of the process as convenient as possible. One way that World Toyota rises above the competition is by supporting your vehicle with quality parts and service. Our service center is more than capable of handling everything from routine maintenance, like oil change service, all the way to major auto repairs. We can also supply you with any parts you may need. Come by our service department in the Atlanta area to take the best care of your car possible. Toyota has earned a reputation as an automotive manufacturer that produces efficient and practical vehicles. The modern Toyota lineup continues this tradition and adds a splash of sportiness for a well-rounded driving experience. World Toyota has a full selection of new Toyotas in stock, so you can find the one that fits you. When you have found the Toyota of your dreams, our finance professionals are available to help you find the best deal possible. We can help you step into all of our most desirable models. Our easy-to-navigate website allows you to learn more about our selection of vehicles without having to take a trip. When you know which car you want, make an appointment online or simply drop by. We can’t wait to meet you. You already know that World Toyota has an accommodating selection of brand-new Toyotas. What you might not know is that we also have many Certified Pre-Owned Toyotas and a large inventory of used cars of all makes and models in the Atlanta area. Certified Pre-Owned cars are carefully selected Toyotas that must pass a thorough inspection and receive protection from warranties when they are certified. Specially trained World Toyota technicians perform these inspections, and only the best vehicles pass. Once a pre-owned Toyota has passed the inspection, it receives a 12-month/12,000-mile limited comprehensive warranty and a 7-year/100,000-mile limited powertrain warranty. If you’re interested a quality Toyota that has the affordability of a pre-owned vehicle and the peace of mind that comes with warranties, check out the Certified Pre-Owned selection at World Toyota in the Atlanta, GA area today. Many car buyers dread the financing process, but World Toyota strives to make it as easy and convenient as possible. Our financing professionals are highly trained and have years of experience, so they know how to help you no matter your situation. To make it even easier for you, our website allows you to begin the application process and get pre-approved from the comfort of your home. Of course, you can simply come into our Atlanta area location to obtain friendly assistance on every step of the process. We also offer you the opportunity to get an estimate on the value of your trade-in through our site. When you’re ready, you can make an appointment to come into our Atlanta, GA area location or just stop by at a convenient time to obtain the assistance of our finance staff. World Toyota offers a full array of leasing and financing offers to help make your dream car a reality. Take a look at the specials and offers page of our website to examine our best available offers. Our selection of deals is designed to fit a wide variety of different financial situations. When you’ve found the best deal for your needs and desires, speak to our finance professionals to ensure that you take advantage of all of the offers available to you. Helping you find and finance the perfect car is only part of our mission here at World Toyota. We are here for you and your car every step of the way with trustworthy service and quality parts. Our service department is known throughout the Atlanta metro area for being reputable and trustworthy. We only staff honest and skilled automotive technicians here to ensure the highest level of service for our guests. World Toyota also offers you the ability to schedule a service appointment on our website for added convenience. You can also come in anytime during business hours. Drivers in the Atlanta, GA areas can treat their cars right by bringing them into World Toyota’s service center today. ^ 4 Year/45,000 no Cost maintenance on New Toyotas (ToyoGuard Platinum). Provided by Southeast Toyota Distributors LLC as an accessory. Provides additional services after ToyotaCare 2-Year/25,000- mile no-cost maintenance. * Honor dealer ads requires dealership's physical written offer on vehicle of identical MSRP, model year, trim level, and lease/purchase terms within 3 days of current date within 100 miles of World Toyota's location. Excludes specialty vehicles. Not applicable to prior purchases. Some restrictions may apply. See dealer for complete details. Offers expire 12/31/2019.